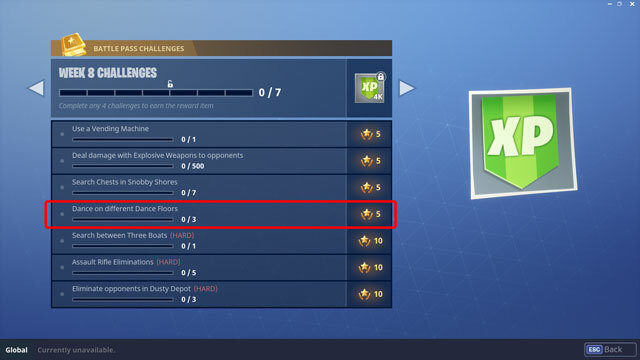 Dance on different dance floors is one of the challenges in week 8 of the latest season of Fortnite Battle Royale. If you want to complete it, you’ll have to find three dance floors hidden across the map, and dance on them. It’s a fun distraction, but the dance floors are actually pretty well hidden. They’re all indoors, in places most players don’t frequent that much. If you’re having trouble finding them, our Fortnite BR dance on different dance floors guide will help you. The first one we found was in the dilapidated house in the forest west of Pleasant Park. It’s the pine forest south of the hill that overlooks Pleasant Park from the west. You won’t be able to see the house while landing, but you also won’t be able to miss it once your feet hit the ground. The dance floor is on the ground floor. The second one is in the trailer park between Lonely Lodge and Retail Row. While you’re landing, you’ll see a tall red barn there – the only real building at the location. The dancefloor is in the barn. Be sure to check the attic as well, there are two potential chest spawns up there. The last one is in Flush Factory, the industrial compound in the southwestern corner of the map. There’s a brown brick building in the southeastern corner of the location. It’s not a part of the factory. When you enter it, you’ll see the dance floor in the next room. If you’re worried about competition – and you have every right to be – you could wait a day or two before attempting this. However, since you don’t have to complete them all in one life, it’s not really that hard when you know the locations.